The main aim of this volume is to develop a theoretical explanation of the conditions under which and the mechanisms through which social movements’ struggles for democracy end up in civil war. While the empirical evidence suggests that this is not a rare phenomenon, the literatures on social movements, democratization and civil wars have grown apart from each other. 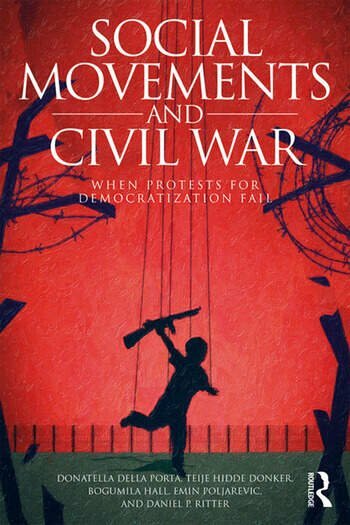 At the theoretical level, Social Movements and Civil War bridges insights in the three fields, looking in particular at explanations of the radicalization of social movements, the failure of democratization processes and the onset of civil war. In doing this, it builds upon the relational approach developed in contentious politics with the aim of singling out robust causal mechanisms. At the empirical level, the research provides in-depth descriptions of four cases of trajectory from social movements for democratization into civil wars: in Syria, Libya, Yemen and the former Yugoslavia. Conditions such as the double weakness of civil society and the state, the presence of entrepreneurs of violence as well as normative and material resources for violence, ethnic and tribal divisions, domestic and international military interventions are considered as influencing the chains of actors’ choices rather than as structural determinants.